San Francisco, Calif. – June 20, 2018 – NGINX, Inc., the company based on the popular open source project and offering a suite of technologies designed to develop and deliver modern applications, has raised $43 million in Series C funding led by Goldman Sachs Growth Equity (GS Growth), a platform within Goldman Sachs’ Merchant Banking Division. NGINX has experienced tremendous growth and customer traction, including adoption by more than 30% of the Fortune 50. With this latest round, NGINX will accelerate its mission to help enterprises on their journey to microservices – a modern approach to application development. 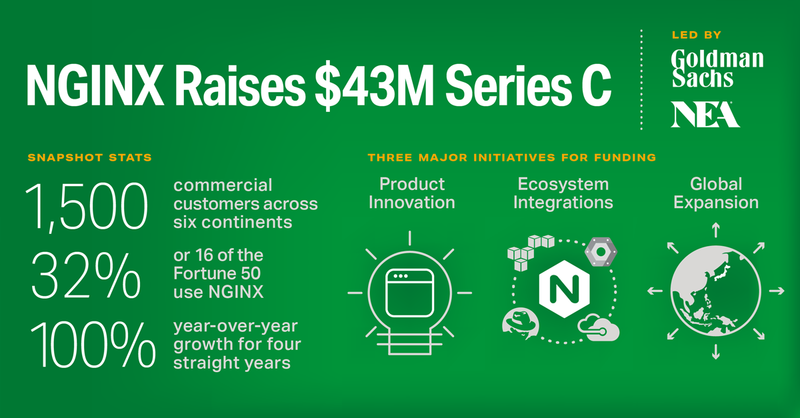 The Series C brings NGINX’s total funding to $103 million. NGINX, Inc. is the company behind the popular open source project trusted by more than 400 million sites. We offer a suite of technologies for developing and delivering modern applications. The NGINX Application Platform enables enterprises undergoing digital transformation to modernize legacy, monolithic applications as well as deliver new, microservices‑based applications. Companies like Netflix, Starbucks, and McDonalds rely on NGINX to reduce costs, improve resiliency, and speed innovation. NGINX investors include Blue Cloud Ventures, e.ventures, Goldman Sachs, Index Ventures, MSD Capital, NEA, Runa Capital, and Telstra Ventures.